So, I just got back from a whirlwind tour of the Richmond, VA area. The Mister is now working for a company based in that area and I came along for the introduction to the new company and great city. It was a fun trip because it included lots of site seeing and I also got to visit with the Mister's peers and their extended families. The tough part was that the company had us on such a stringent schedule that by the time Saturday rolled around we were completely worn out. It was supposed to be our free day to explore the city completely on our own. Instead we lounged around in the comfy hotel bed, watched television and occasionally hung out on the balcony overlooking some pretty cool old buildings. We stayed at a little boutique style hotel, the Berkeley. It was tiny, but well appointed and very cute. I have already decided that the next time we visit I want to get more actual shopping time mixed in so I can really check out the Carytown district, as well as, spend some time touring the museums and estate homes. Section of funky shops in Carytown. Image from FLICKR, Wahig. We did eat at a couple of really wonderful restaurants, one is Sensi and the other is Mamma Zu's. Sensi stated it is an Italian chop house and had a variety of items making it a good place for a group with very different tastes. 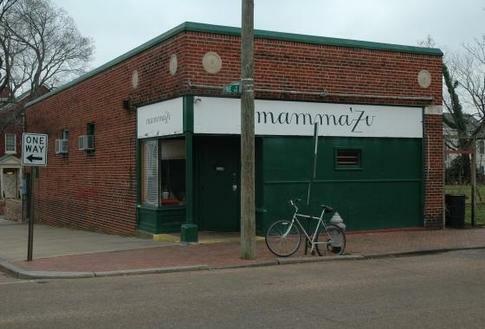 The very unassuming Mamma Zu's had some of the best home-style Italian food I have ever eaten. Very comparable to places I have been to in New York. Plus, we went with a bunch of pure bred Italians and they agreed that this was the real deal. Apparently Mamma Zu's is very difficult to get in to and will only take reservations for 8 or more. Luckily we had gathered 10 folks for this night out and were able to get right in. During our couple of hours there the line of waiting patrons stretched from the back of the little building, out the door and on to the street and did not let up for a minute the entire time we were there. It was worth it, so I know why everyone was so patient. There is definitely a lot to do in Richmond and I would suggest it to anyone as a fun 3-4 day weekend getaway. Although, I would also suggest going at a warmer time of year. It got a bit chilly several evenings while we were there. I LOVE the bike out front of Mamma Zu's! Too cute! I traveled through VA. this past September. Lots of fun places to shop! @michael - don't be so sure .